More precisely, 47.2% of the devices protected by the cybersecurity firm were targeted last year, up from 44% in 2017. Targeted devices include Windows computers used for SCADA systems, historian servers, data gateways, engineering and operator workstations, and human-machine interfaces (HMIs), along with systems used by industrial network administrators and industrial automation software developers. In the second half of 2018, the company’s solutions detected more than 19,100 pieces of malware belonging to 2,700 families, roughly the same as in the first half. However, Kaspersky pointed out that a vast majority of these attacks were part of random attacks rather than targeted operations. “In each month of 2018, the proportion of ICS computers on which malicious activity was prevented was higher than that in the same month of 2017,” Kaspersky said. Trojans were the most prevalent (27.1%), followed by DangerousObject detections (10.9%), downloaders (4.8%), and worms (4.8%), the company said in its latest report. 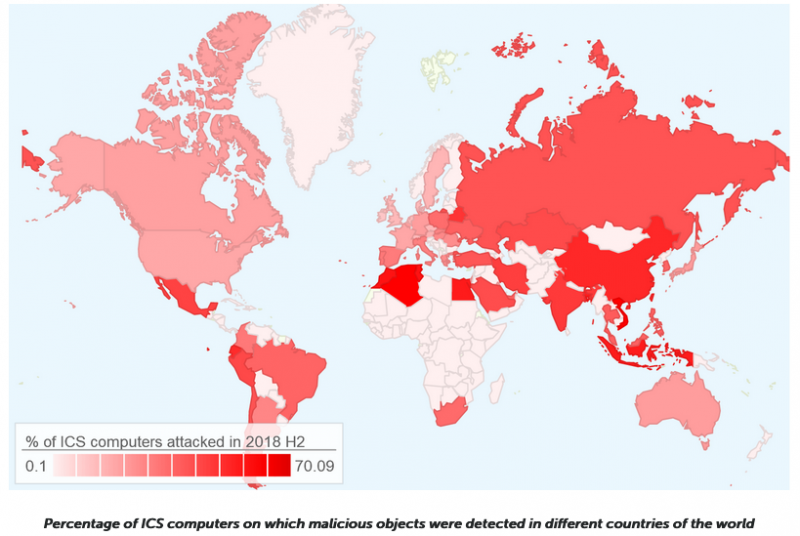 The countries where the highest number of malicious objects were detected in the second half of 2018 were Vietnam, Algeria and Tunisia, while Ireland, Switzerland, Denmark, Hong Kong, the UK and the Netherlands were the least affected. The Internet continues to be the number one source of threats, accounting for 26% of targeted ICS computers. This percentage has decreased slightly compared to the first half of 2018 (27.3%), but increased significantly compared to 2017 when it was at roughly 21%. The percentage of incidents involving removable media devices remained fairly constant throughout 2018 (8%), but incidents involving email increased by over one percentage point (from 3.8% to 4.9%) in the second half of 2018 compared to the previous 12 months. “The percentage of ICS computers on which malicious email attachments were blocked has increased in nearly all regions of the world. This change probably reflects the growth in the number of phishing attacks on industrial enterprises in H2 2018,” Kaspersky said. The main source of threats in H2 2018 was Africa, followed by Southeast Asia, Central Asia, South Asia, Russia, Latin America, the Middle East and Eastern Europe. North America, Western Europe and Northern Europe are at the bottom of the chart.